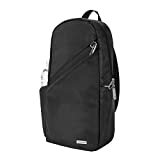 My first experience using a Travelon bag was when I used the Travelon Anti-Theft Classic Tour Bag on a spring cruise through the Mediterranean. Pickpocketing is of high concern in parts of Europe, and I wanted an anti theft purse with extra security features. 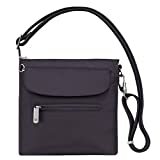 As it was spring and our ports of call were all in urban cities my only requirements for a daily purse was for a non-descript, smallish purse that could hold my mirrorless camera, a wallet and a few girlie things like a small cosmetic bag for my lip gloss. I liked the Travelon purse, and it served my purposes well when running around the city. 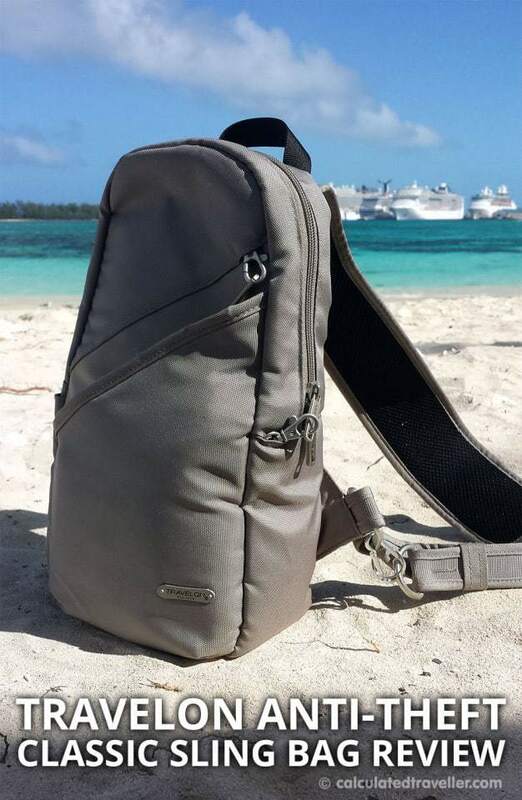 For a Florida road trip and a Caribbean cruise, however, this bag was lacking a few features. Specifically, I needed additional room inside the bag to hold sunscreen, hat, camera, hand sanitizer, a book, notepad, mp3 player and water bottle. 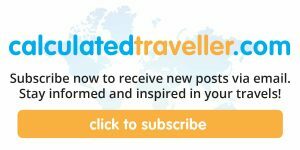 Travelon sent me the Classic Anti-theft Sling Bag to try out and review. 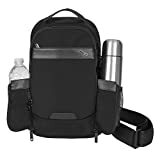 Travelon is a well-known company that manufacturers all sorts of products such as toiletry kits, duffel bags, backpacks, messenger bags, laptop bags, as well as travel accessories like luggage tags and compression packing bags. They even have wheeled underseat carry on luggage and as would be expected with a company that manufactures travel goods luggage security, is one of their top features. I decided on the colour “Stone” for the beach/summer. I worried that it would get dirty quickly due to the light shade of beige, though, and it did but, once home, I found the nylon fabric to be durable and easy to wipe clean. The Travelon sling bag is comfortable to wear, and I liked that I could change the strap for the right or left side. I’m not sure if it is user error on my part, but I did find that the strap would start to loosen and start to slide down due to the weight of the contents inside. I solved this by attaching a carabiner to lock the strap in position by hooking it to the bottom hook of the bag. The extra carabiner proved to be useful because I could then hook my hat to my bag when I went inside a shop or restaurant. 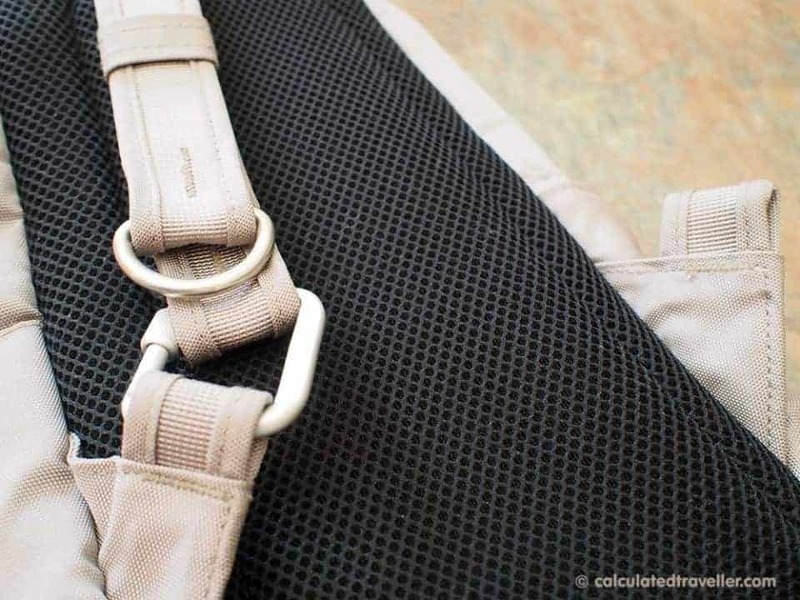 One thing that is awesome is that you can undo the bottom hook and wrap the strap around a chair or table so that no one can steal your bag and run without taking the furniture with them. 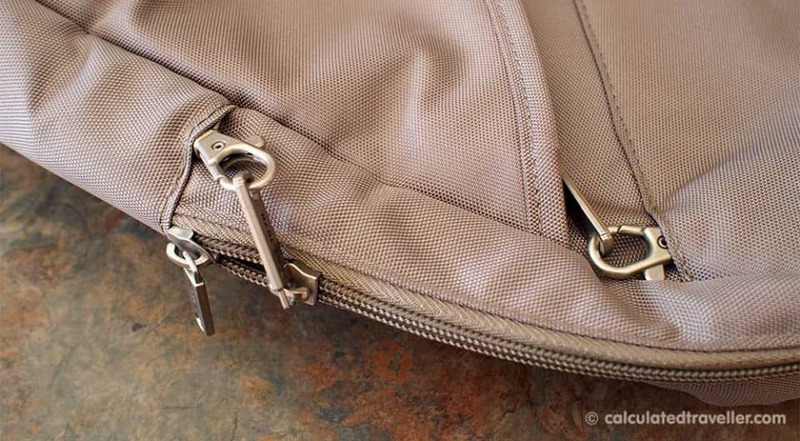 Here’s a photo of the anti theft sling bag without the carabiner so that you can see it in its original form. The slash proof strap is a bit stiff at first due to the metal wire running through it and needs some “working in” to make it more pliable and flexible. 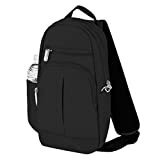 The bag is roomy enough to hold a lot of things, but I found that I would start carrying more stuff, and it would start to get heavy especially with the addition of a full water bottle. Speaking of the water bottle: At first glance, I thought the side pocket was too shallow, and that the mesh/elastic would be too tight but it worked out just fine and held purchased bottles of water and reusable water bottles. Do be aware that you can’t put a very wide bottle in the water bottle pocket. Security is a big selling point with Travelon anti theft bags and the toggle clips on the zippers to deter pickpocketing are great. Just know that they aren’t totally theft-proof, as there is no way to add an actual lock. One issue that I had with my original Classic Tour Bag from Travelon that is still a problem with this Classic Sling Bag is the lack of a waterproof zipper or at minimum a flap over the zipper to help prevent the rain from saturating the zipper and thus moisture seeping inside. I always travel with a prime (fixed) lens on my mirror-less Olympus camera but there is more than enough room should I wish to use my kit lens. Even if I wanted to bring along a telephoto lens, I think I’d still have room for a wallet, notepad, etc. One key thing that is missing is a spot to hold a few pens. There is a pocket but no particular slim pen slot. 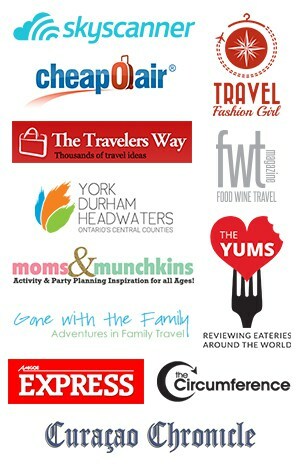 All in all, the Travelon Classic Anti-theft Sling Bag is a great bag for travel. It will easily carry plane tickets, small camera, wallet, small umbrella, water bottle, guide book/notepad and be safe and secure. I plan on using it on many more trips to come. 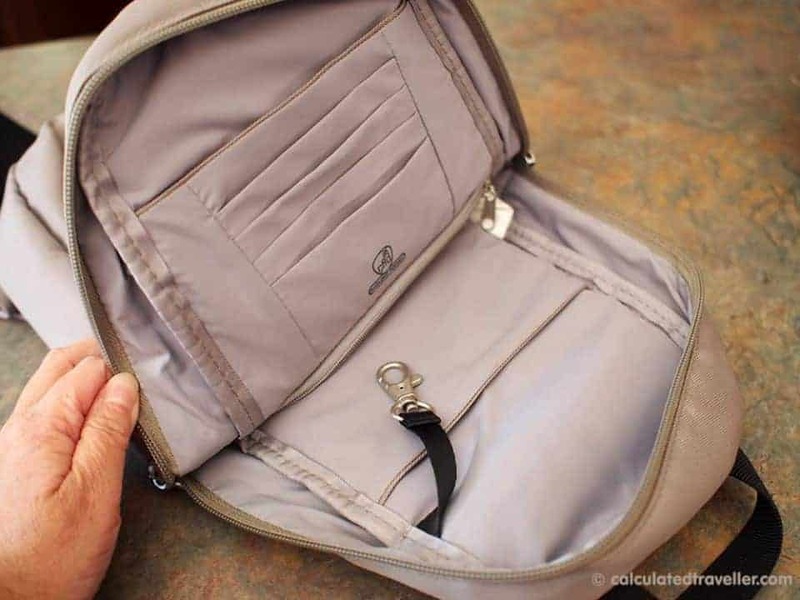 I hope you found this anti theft sling bag review helpful. 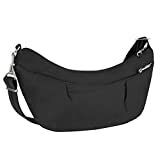 My Classic Anti-theft Sling Bag was provided by Travelon for review purposes. I did not receive financial compensation for this review. My opinions, as always are entirely my own. In addition to all of its security features, I love that it wipes clean so easily. My bags really take a beating when traveling and being able to clean them quickly and easily is important.